I know that this is an unusual topic--discussing the potty habits of people at work, but this just has to be said: Guys Grow Up! I was appalled the other day upon entering the men's restroom closest to my office and found that many (more than half) of the toilets had not been flushed after use..
What gives? That is just gross! While I may be talked into a discussion of toilet paper being the greatest invention since the beginning of the world, I don't want the used variety floating in the bowl when I arrive. Guys, grow up and clean up. Wives, girlfriends, kids, and housemates probably don't flush for you, so don't expect someone at work to follow and flush behind you! 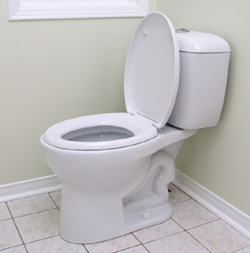 And one other thing--lift the seat if you are not sitting when you use the toilet. That is gross too! And we wonder why laws are passed governing the most obvious things, like not texting when we drive--if we can't get toilet habits down, how are we ever going to drive a vehicle?